On May 16, 1863, as the dust and smoke settled on the Champion Hill battlefield, Lt. Col. John McLaughlin, 47th Indiana, began looking for his brother Lt. Henry McLaughlin, 35th Alabama Infantry. When the two met face to face on the blood strewn battlefield, John took his brother prisoner. The incident was reflective of war stories that pitted brother against brother and family against family. In the years prior to the war, John and Henry McLaughlin and their five siblings were residents of Indianapolis, Indiana. The McLaughlins were a close-knit family and John and Henry were especially devoted to their sisters, Elizabeth and Susan. A number of years before the war, Henry migrated south where he married Sarah Canady and settled on a small tract of land in Florence, Alabama. As news of the war spread across the Southland, Henry was mired in conflict since his parents and siblings remained in the North. However, his first devotion was to his wife and child and to the protection of his land. On July 1, 1861, Henry made the decision to enlist as a private in the 35th Alabama, and to go to war even if it meant having to fight against his brothers. On May 16, 1863, as the war progressed toward Vicksburg, Henry's regiment found themselves hotly engaged in the Battle of Champion Hill. The battle was the bloodiest and the most costly of all the battles prior to the Siege of Vicksburg. Incomplete records filed by Confederate officers after the Battle of Champion Hill listed their losses as 381 killed, 1018 wounded, and 2,441 missing. Henry was listed as AWOL since he did not answer roll call. The following day, it was learned that Henry McLaughlin's name was on the list of the Confederate soldiers who had been captured and taken prisoner. As fate would have it, Henry had been taken prisoner by his own brother. John described the capture as "a singular meeting on the battlefield." The prisoners from Champion Hill were placed on a train and shipped north to Johnson's Island. On June 4, the train made an overnight stop in the McLaughlin's hometown of Indianapolis. The local paper, The Indianapolis Daily Journal, documented the arrival of the prisoners: "Among the rebel prisoners that arrived here yesterday was Lieut. Henry McLaughlin of an Alabama regiment, formerly of this city. He is a brother of Lieut. 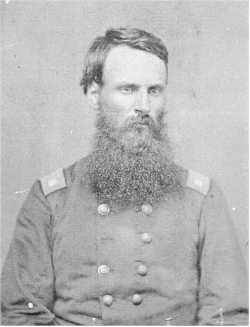 Col. John A. McLaughlin, of the 47th Indiana. Both brothers fought almost face to face in one of the fiercest battles near Vicksburg, one in command of a regiment and the other in command of a company. Lieut. McLaughlin removed from here some years ago and tarried at Florence, Ala., where he has a wife and child. He was visited at the Soldier's home last evening by his relatives here, who conversed with him freely for some time." Meanwhile, back in Mississippi, John McLaughlin was heavily engaged in the Siege of Vicksburg. On June 15th, he took the time to write to his sister, Susan, who was serving as a nurse in the Union army. The letter expressed no remorse over having sent his brother to prison. "Dear Sister, Last week I got a letter from cousin John B. McLaughlin written at Murfreesboro, Tenn. He made inquiry if I knew anything of Henry. I told him of our singular meeting on the battle field and that the last I heard from him was from the Indps Journal of June 4th when he was receiving visits from his old friends and relatives at his old home Indianapolis." Undoubtedly, John considered Henry to be a traitor to the North and felt that he deserved prison time to pay for having betraying his country. The remainder of John's letter expressed his patriotism to the Union: "We intend to add one more, and the crowning star to the already long list of victories - Vicksburg, yes it must and shall be ours. This is not only my feelings, but the determined feelings of this vast army surrounding as with a terrible line of bayonets the entire rear of the besieged place. Let God and justice be our motto and right will be on our side, and victory perch upon our banner. Union and liberty now and forever our reward." On June 24, a short time after arriving at Johnson's Island, Henry wrote to his sister, Elizabeth, from his prison cell: "Dearest of sisters, do not think for a moment that I have forgotten you although political convulsions and contending armies have even prevented correspondence. But now I am situated so that I can write short letters I embrace with pleasure the opportunity although it is from a prison cell. The ties of nature as well as those of affection still bind my sisters dear to me. They may censure me for the past, but if they do I cannot help it. I know that my life has been mingled with error…..Do not think hard of me for being a rebel officer. We all have to be governed by circumstances, when they are unavoidable, and to you Dear Elisa I will say that my heart is true to the union as that of my Brother but we was differently situated. The circumstances that surrounded me I cannot give you now as I have written as much as the regulation allows. Your affectionate brother, Harry [Henry] B. McLaughlin." As Henry languished in prison for 20 months, John McLaughlin continued in his war efforts, oblivious to the plight of his brother. By 1865, Susan could no longer stand the situation. Highly respected in her role as a Union nurse, she requested that Indiana's Governor Morton write her a letter of introduction to present to President Lincoln. Armed with the governor's letter of endorsement, she arranged a meeting with President Lincoln at the White House with the hope of having Henry pardoned. President Lincoln inquired, "Upon what grounds do you ask for the release of this prisoner?" Susan replied, "Upon the grounds that we believe him to be a loyal man who was forced into the Confederate Army against his will." On the back of the Governor Morton's letter, President Lincoln wrote instructions to the secretary of war to arrange for the immediate release of the prisoner. On January 24, 1865, Henry took the oath and was released from prison. The discharge was timely since two months later, April 9, 1865, General Robert E. Lee surrendered to General U. S. Grant, bringing the war to a close. Following his release from prison, Henry returned to Florence, Alabama, where he resumed life with his wife and child. Three years later, John moved to Topeka, Kansas, and established himself as a gunsmith. It is unknown if the brothers ever met face to face again.